Depending on whether you prefer to see the glass as half full or half empty, the technical picture for gold stocks is either great – or horrible, at this point. The HUI continues to trace out one successive megaphone pattern after another. There is the big one that was begun in November-December last year. It seems like the stocks just can’t get themselves to break out of their funk, and that makes a lot of sense when you consider declining ore grades, no big, new discoveries, and astronomical and rising production and transportation costs, not to mention the environmental concerns. Yet, despite presenting such an anemic picture, there is light at the end of the tunnel. Blinding light, one might say. The fact that the successive megaphone patterns are all following along the upper border of the configuration speaks well for the stocks’ future prospects. At least, there are no exacerbating wild swings that take the HUI all the way from the top to the bottom of the original “big” megaphone starting in November. Taking away the lines drawn above and starting with a clean slate, two other and equally compelling technical patterns can be demonstrated. One of them is a rising up trend channel if one ignores the short dip below its lower trend line in mid-December. 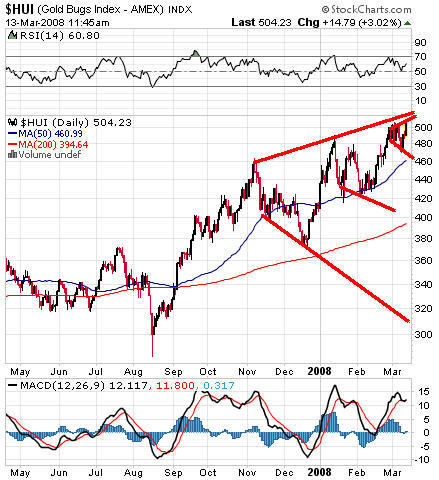 What they all share in common is the upper boundary or trend line. The HUI must break out of that one in a very convincing way before it can shed its current doomsday pattern and overcome the tremendous gravitational pull of the factors outlined above. That breakout, however, will not necessarily come from gold’s passing of the psychologically important $1000 barrier. That, alone, is not enough. 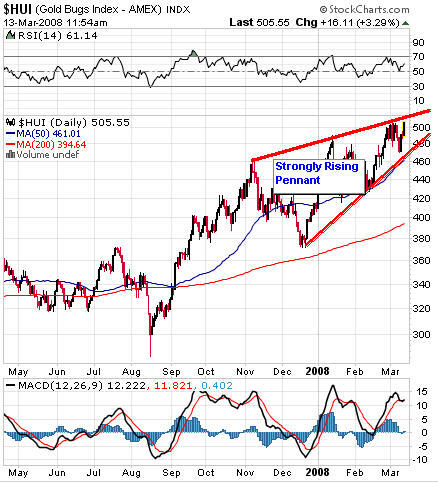 Naturally, as long as gold and silver keep on rising, the stocks are very unlikely to suffer significant falls. However, if gold does take its by now near-traditional mid-year plunge in 2008, the downside potential of the stocks is absolutely humongous. 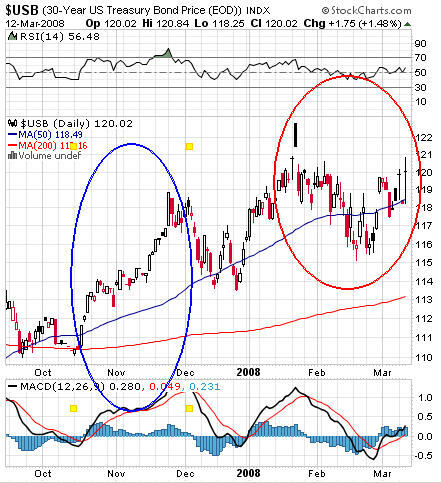 That point alone screams for caution to the utmost for hopeful gold stock investors. But then again, there may very well not be a midyear correction this year. In times like these where the entire fabric of the US financial system is being torn apart by incurable distrust among banks when it comes to lending to each other (witness Bernie’s latest “prime for slime” ploy of swapping pristine treasuries for subslime-infected mortgages), erratic, frantic and ill-conceived Fed policy moves are lighting gold’s afterburners on its rise into the fiat-dollar price stratosphere. The point is: It pays to wait. If by the end of June no major correction in the gold price has occurred, the chances will be very good that it will not happen. The crucial factor to watch out for is US treasury bond prices. Bond investors, as sophisticated as they are always said to be, are a very confused bunch right now. The level of their profound confusion can easily be gauged from the horrific, terminally disorganized picture of the30-year bond's price movements. Poor bond investors. Sophisticated they may be, but their thinking is still stuck in the paper and computer blip world of breakable promises and government-decreed make-believe. Right now, they are disoriented and have no clue where to go. They will soon get one. As I keep saying: The day the bond investors and the regular stock investors simultaneously abandon any last hope of future gains in their respective investment markets (other than shorts) will be the day the gold stocks will start enjoying a mania that puts all prior manias to shame. In other words: Gold stocks will take off when everything else (besides precious metals) goes to hell. However, a mania it will certainly be, and it should be treated with the same caution as all manias. The coming gold stock mania can get so out of hand that even consistently rising gold prices will not soften the blow when it finally collapses. Gold itself, on the other hand, will keep on rising and rising in fiat terms. It may occasionally enjoy its own manias, but their breakdown will not affect the underlying bull market. They will merely mark occasional up ticks within its inexorable rise. 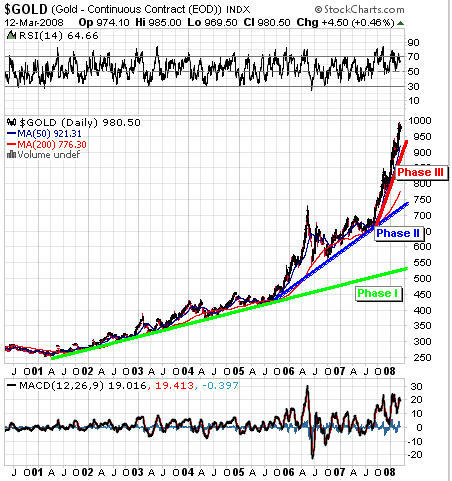 For example, gold could fall back to the $900-$950 range without violating its current Phase III bull run, or back to $750 without violating Phase II, and all the way back to $550 per ounce without breaking its Phase I uptrend going back to 2001. $750 may be revisited briefly in a super-correction, but never $550, quite simply for the reason that, by the time gold goes back down that far, there may not even be a US fiat-dollar currency left to fall against! While investing in gold stocks will, like all stock-investing, remain a matter of knowing when to buy and knowing when to sell, successful investing in physical gold will continue to be mostly a matter of knowing when NOT to sell for a very long time. Monitor subscribers will know both.